Here is my ‘In a vase on Monday’ with tête a tête daffodils making a re-appearance; this time with a pansy (with Yoda). I hope you like it? Cathy over at https://ramblinginthegarden.wordpress.com/ hosts this weekly challenge to pick and display flowers from your garden in a vase. This week she’s got sweet william, tulips and some aquilegia. I think it’s a lovely natural posy and a great vase too. 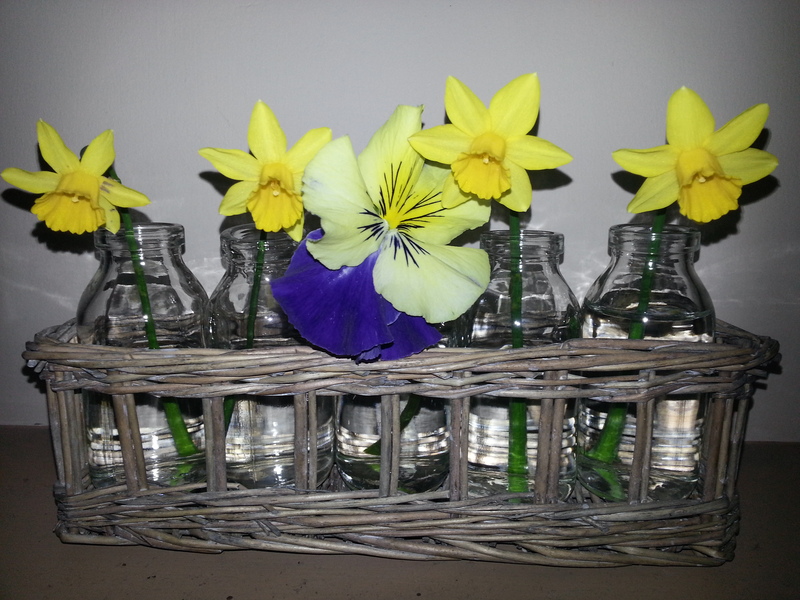 I’d seen Gwirrel’s garden using mini milk bottles with crocuses and Cathy use mini milk bottles in a crate a couple of weeks ago – with Hellibores – Don’t they look great? It was pouring with rain this morning in Manchester but I had my eye on a few flowers around the garden and was hopeful I could do something with my milk bottle set. I nipped out when I got home from work and picked these flowers. It was fairly sunny when I took these photos but I definitely needed the flash to see the colours properly. Here’s the arrangement on my mantlepiece in my lounge. It’s a great idea #In a vase on Monday and I hope I can find some flowers for next week – I don’t have a greenhouse so we’ll see what’s flowered. It’s fascinating seeing which plants are flowering, who’s got flowers growing in their greenhouses and also who’s gardening in more extreme conditions than here in a small suburban garden in Manchester. Have you had a go this week? I’d love to see what you’ve done. 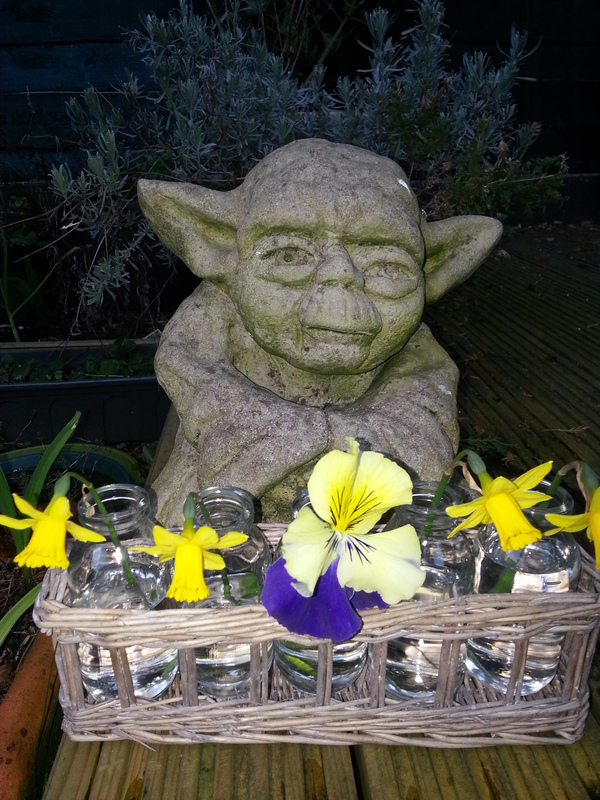 This entry was posted in Gardening and tagged daffodils, In a vase on Monday, milk bottles, pansy, yoda on March 23, 2015 by Bec - views from my garden bench.